Chemical Indicator Inks Market size was valued more than USD 35 million in 2015 and is forecast to experience gains exceeding 7%. Global chemical indicator inks market is primarily driven by robust product demand in surgical instrument market. Sterilization processes are predominantly used in surgical instruments, as they remain in direct contact with the patient during the surgical procedure. Global surgical instrument market generated revenue over USD 5.5 billion in 2015. Increasing usage of disinfection and sterilization procedures in surgical applications to prevent hospital associated infections will drive industry growth in the near future. Nosocomial infections and their control is a global challenge considering the high morbidity and mortality of patients. Additionally, nosocomial infections increase the expenses on health care due to added antimicrobial treatment and prolonged hospitalization. Furthermore, high expenditure on healthcare in APAC countries including China, Japan and India will consequently propel global chemical indicator inks market size by 2024. Food & beverages are one of the major segments of the global packaging market. Canned food market such as fish, meat, and other perishable foods, is expanding, as canned food offers increased shelf life along with advantages such as retention of flavors of packed food. In addition, global rigid packaging market was marked at over USD 150 billion in 2015. This will ultimately boost chemical indicator inks market share. These products are used in flexographic and rotogravure printing processes primarily consist of four components: solvent, resins, colorants, and additives. These are fluidic in nature majorly due to petrochemicals use as solvents. These solvents dry in ambient air, releasing a significant amount of volatile organic compounds, which are environmentally harmful. However, bio-based chemical indicator inks which includes naturally available materials instead of petroleum-based materials as solvents has created new industry growth opportunities. Challenging formulation process is significantly affected by the printing process selected. For instance, the flexographic printing process is fluidic than that used for screen printing, which increases the overall cost owing to negatively influence chemical indicator inks price trends. Steam sterilization generated revenue more than USD 15 million in 2015 and is one of the most preferred process in the medical sterilization application as it does not contain any toxic content, which makes the process extremely safe for surgical instruments. Also, the process is preferred on all critical and semi-critical items that are heat and moisture resistant. Ethylene oxide is forecast to witness gains more than 8% CAGR by 2024. Ethylene oxide sterilization is mainly used to sterilize medical & pharmaceutical products that cannot support conventional high temperature steam sterilization such as electronic components, plastic packaging, or plastic containers. Ethylene gas use for low temperature applications is one of the key advantages of the process. Flexographic printing demand is projected to rise with over 9% CAGR, being the most widely used process. It can be used in numerous substrates including paper and plastics. Market share of this process should increase significantly by 2024 owing to wide variety of substrate printing along with the usage of environmentally-friendly composition of chemical indicator inks through water based formulation. Rotogravure printing uses solvent based chemical indicator inks that are mostly fluidic and suitable for chemical indicator printing. Formulation or constituent composition for this printing process is almost similar to that of flexographic printing. However, chemical indicator market share for rotogravure printing may be moderate due to costlier printing components. Water-based chemical indicator inks market share generated revenue over USD 18 million in 2015. The industry share for this product will increase by 2024 owing to rising environmental regulations for volatile organic compounds (VOC) emissions. UV cured chemical indicator inks market will experience 6% growth over the forecast timeframe. These are comparatively different than the solvent-based and water-based, as they do not contain solvent as drivers, but instead use photo initiator polymer. Photo initiator polymer gets activated as soon as it is exposed to concentrated UV radiation, forming cross links of components to form solid. UV-cured provides qualities such as excellent rub resistance, chemical resistance, color consistency, and superior gloss. Global chemical indicator inks market share for sterile bag was valued at over USD 3.5 million in 2015 and will witness continuous growth owing to its widespread applications in the medical industry. Being transparent and perforated, these bags assist in ease of penetration of the sterilant for complete sterilization. Tapes will experience gains more than 9% CAGR over the forecast timeframe. Tapes have these inks on one side and adhesive on the other. They facilitate ease of pasting and immediate identification of sterilization process completion through change in the color inks on these tapes. Indicator tapes are available for usage in wrapping packs for steam and ethylene oxide. These tapes can also be printed with additional information directly on tape surface, thereby assisting the user in proper usage and disposal of tapes. North America, led by U.S chemical indicator inks market size was more than USD 13 million in 2015. Significant aging population in the region, resulting in rising demand for healthcare facilities will boost product demand for sterilization owing to propel industry growth. Furthermore, Europe chemical indicator inks market should grow at over 8% owing to increasing environmental concerns over VOC emissions will boost consumption of water-based products. Global chemical indicator inks market share is competitive with industry manufacturers chemical are integrated forward to manufacture suitable for sterilization process. 3M, Tempil, NiGK Corporation, Riken Chemical, Terragene SA, STERIS, North American Science Associates Inc. (NAMSA), Crosstex and gke Gmbh are some the prominent industry share contributors. Chemical indicator inks are used in the manufacture of chemical indicators, which are predominately employed in sterilization monitoring systems. These indicators provide a visible sign, typically through a change in color when exposed to certain conditions such as presence or absence of a threshold concentration of a chemical species such as an acid or an alkali in a solution. The global industry is primarily driven by increasing demand for sterilization monitoring in the sterilization market, especially in the health care industry. 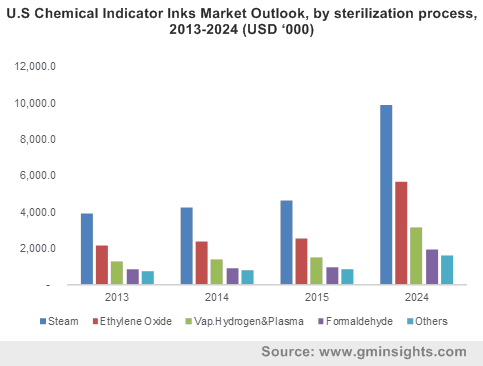 Additionally, rising awareness of the sterilization processes in developing regions and stringent norms for sterilization in developed regions is expected to propel demand.